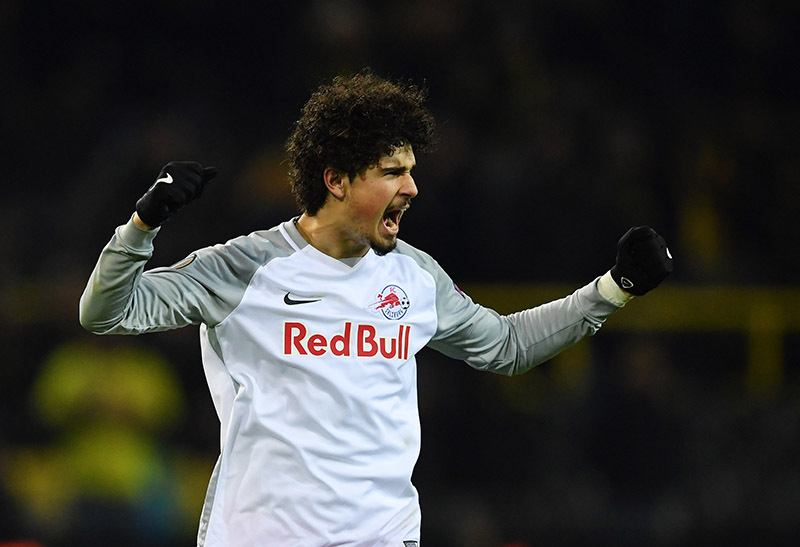 The Red Bull Arena hosted Salzburg vs Dortmund – with the home side two-one up from the first leg a potential shock was on the cards. After a woeful display in the Champions League, die Schwarz-Gelben had earmarked the Europa League as a season-saving piece of silver-wear. However, they were unable to really test their Austrian neighbours over the two legs and the Bundesliga side crashed out of Europe for the second time this season. After an excellent display seven days earlier, Marco Rose named the same Salzburg eleven that had performed so brilliantly in the Westfalenstadion – meanwhile Peter Stöger was without USMNT international Christian Pulisic who was absent due to a cold. Dan-Axel Zagadou made his Europa League debut whilst Lukasz Piszczek returned at right back. Dortmund captain Marcel Schmelzer spoke of a lack of basic virtues in the first leg after their surprise defeat – he will not have been pleased to witness Zagadou give the ball away needlessly on six minutes, Europa League debut or not. Salzburg attacker, Hwang Hee-Chan was onto the misplaced pass like a shot, forcing Roman Bürki into an early save. The opportunity seemed to spur the South Korean forward, as the half moved on he became the main threat to the Schwarz-Ggelben – Sokratis played a suicidal square ball across the backline and the 22-year-old once again forced Bürki into a good save. In a must-win game, Dortmund had so far failed to mount any sort of attack. As the half-hour mark passed it was Dortmund’s Swiss ‘keeper who was called into action once more – this time it was Xaver Schlager who tested the 27-year-old. Bürki – criticised at times throughout the season for a lack of concentration – pulled off a tremendous save to deny what looked an almost certain goal, down quickly to his right pushing a wonderful strike past the upright. Mahmoud Dahoud broke into the Salzburg box on 36 minutes, the midfielder found an unmarked Marco Reus who in turn tried to pirouette on the ball – he got it all wrong and fell over, it summed up the first 45 minutes for the German side. After a poor first half Dortmund started the second needing two goals without response to win the tie. Peter Stöger used the break to make a double substitution – Alexander Isak came on for Marco Reus and Maximilian Philipp replaced Mario Götze, it was a bold decision from Dortmund’s Austrian coach, back on home soil. 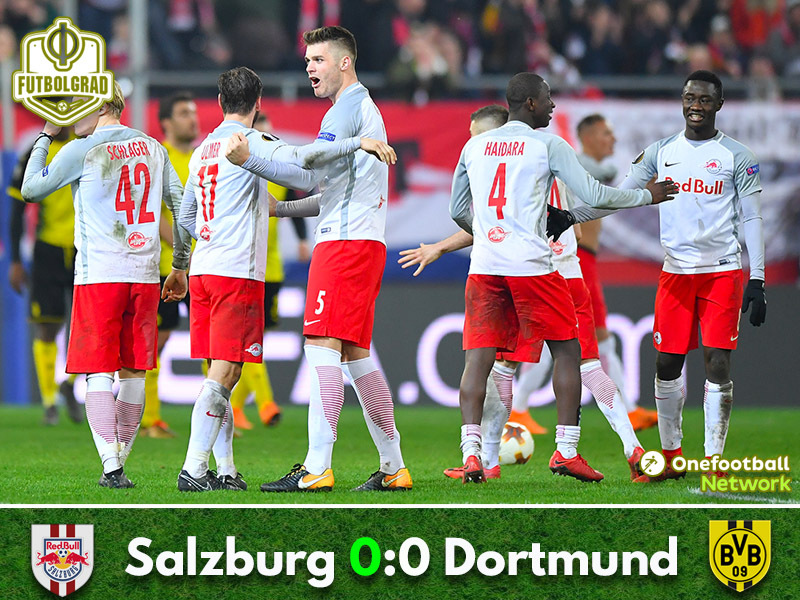 It changed little – Salzburg didn’t back off from their attacking mindset and as Dortmund became more desperate for a goal the Austrian’s looked to pick them off on the counter. With the game moving into the 50th minute it was wide open, not the situation the yellow and blacks would have wished for. The deadlock was almost broken twice within a minute as the clock showed just over 30 minutes remaining. First, Schmelzer smashed a volley goalwards from the edge of the area – the Dortmund captain in acres of space had the time to pick his spot, all he could find was the arms of Salzburg’s Alexander Walke. From the goalkeeper’s clearance the hosts found themselves three-on-one but Valon Berisha foolishly opted to shoot and Zagadou was able to make a last ditch block. Even the introduction of Raphael Guerreiro couldn’t do anything to help Dortmund find the first of two crucial away goals. As the game crept into the last 10 minutes the visitors had registered five shots on target but their hosts had been equal to each one. As the final whistle blew Dortmund once again bowed out of European competition with a whimper. The Brazilian defender was equal to any threat or half chance that entered his area of policing. With six key interceptions he broke down attack after attack from the visitors as the German’s desperately tried to find a goal. Dortmund tried in vain to find a way past their Austrian neighbours, as the game drifted out of their grasp their attempts became more desperate. A woeful performance in leg one set the tone for a tie that never really had the home side worried – Salzburg become the first Austrian side to reach the last eight of the competition.